"If we adopt this report, our ill-wishers and naysayers will claim that what happened in the (Sabra and Shatila) camp was genocide," Defense Minister Ariel Sharon warned the cabinet in 1983 during a special meeting dealing with the findings of the Cohen Report on the Sabra and Shatila massacre in the First Lebanon War. Sharon refused to resign, as the external fact-finding mission's report had recommended, and repeatedly stressed that he and then Prime Minister Menachem Begin were in the same boat. Adopting the report, Sharon claimed, would "leave a mark of Cain on us for generations to come." Thirty years later, the State Archives on Thursday cleared for publication the protocols of cabinet meetings from the early 1980s, specifically those dealing with the outcome of Cohen Report and the death of Peace Now activist Emil Grunzweig. 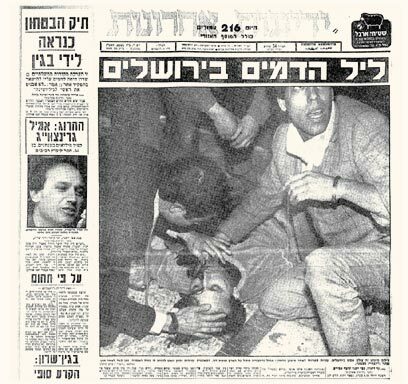 The main meeting held following the publication of the report by Chief High Court Justice Yitzhak Cohen took place on Febuary 10, 1983 - the day Grunzwieg was killed. Sharon arrived late. Prime Minister Begin noted that Sharon had informed him of a Peace Now protest being held near his farm causing him to run late. Sharon eventually arrived but not before all those present called for a full implementation of the report's recommendations, despite the price Sharon would have to pay - stepping down as defense minister. Sharon, whose resignation was recommended in the report, as well as a desicion barring him from ever holding the Defense Ministry portfolio again, arrived very tense, and began lashing out. "I am not keen on getting into personal reflections nor searching for victims and scapegoats. On the face of it there are parts of the report that could, and should be adopted. However, I found parts which in my opinion should not be accepted. The question is much broader than the personal question - of which people seem to focus on ceaselessly - of whether Sharon will go or not. "The chapter regarding indirect responsibility is the most severe in my opinion. The committee determined that the State of Israel, not just the government of Israel, or the Israel Defense Forces are responsible. The committee determined that not only did the possibility of the massacre exist, it was also known to the political and military echelons, and they chose willingly and knowingly to ignore it. "That includes all of us, including you Mr. Prime Minister, each and every one of us. I cannot stress this enough - knowingly ignored, all of us," he continued to stress. Then came the warning: "If we adopt this report, all our ill-wishers and naysayers will claim that what happened in the camp was genocide. Not to mention the fact that the committee itself didn’t even seem to hesitate before drawing a line between Israel and its partners to the pogroms and the horrors Jews experienced. I personally refuse to accept even the slightest hint of such allegations. "There are parts of the report which I believe we just cannot accept if we do no want this burden - this mark of Cain - to be imprinted onto our forehead for generations to come." Sharon decided that he "refuses to accept indirect responsibility because there was always an eminent threat of bloodshed by the (Christian) Phalanges; regardless of whether or not they cooperated with the IDF or not. This was a premise known and accepted by all of us. "During Operation Peace for Galilee (the original name for the First Lebanon War) when we cooperated with them, everything worked properly. However, the committee reached the conclusion that that successful attempt couldn't be indicative of future mutual endeavors. "Every single member of the political and military echelon testified, under oath, that positive experience made the possibility of such a massacre unconceivable. Hence, I reject the report's findings that the entire respectable group of people was wrong, that we were all wrong, all the way from the Prime Minister down, bar no one." Sharon refused to accept the conclusion that it was of no importance that at the time the decision was made to allow the Phalanges to enter the camp there was no way to predict they would undertake a massacre. The reason was that his testimony was geared at justifying inaction. "The prime minister said that, does the prime minister lie? Why are you in a rush, why the hurry?" Justice Minster Yosef Burg responded: "Nobody is in any hurry, why are you scolding us?" "I'm not scolding, I'm enjoying myself, believe me," Sharon sarcastically retorted. Sharon seems to be conscious of the fact that the discussion was one for the books of history. "Because the transcribers keep changing, I want every part to have this on record: I did not come here to refute all of the committee's findings, rather (to argue) that this issue can place the mark of Cain on all of us for generations." Sharon quotes the report's findings which claim that he authorized the Phalanges' entry into the camp in order to avoid IDF casualties. "Mr. Prime Minister this is the most serious accusation that has been attributed to me. They do not claim I joined their ranks, nor that I killed with my own hands, rather that I acted out of a desire to protect soldiers. "If they came and said that taking into account the lives of our soldiers is not a legitimate consideration any longer, then I am willing to stand before each and every one of you, before they cut my head off, and tell you to your face that in my opinion the lives of our soldiers are, and must be, a central consideration." As the meeting continues it shifts to the report's personal recommendations: "Mr. Prime Minister, I say this with the utmost humility, I truly do not believe I need to resign for this. And that is my major crime. I welcome them to search for others and look around. If that is my major crime I tell you Mr. Prime Minister I honestly do not believe that I need to resign. "Those who think my resignation will solve everything are wrong. Those who believe that me taking one for the team will calm the beast are wrong. The very same day it will want fresh blood." The tension between Sharon and Begin is felt, and the defense minister tries to alleviate it. "I haven't blamed the prime minister! I want to declare that I did not blame the prime minister, not even for the smallest of details. Let the prime minister testify. I blamed the prime minister of something? Not the prime minster and not anyone." Begin: "The claim was that the report insinuated that everyone who testified…"
Sharon: "….I request the protocol state that I did not blame." Begin: "But that was the intention." Sharon: "Even today we are blamed for genocide; the formulation of the indirect responsibility on the State of Israel must be stricken from the report. Either that or it cannot be accepted by the government or it wall cast an indelible stain". Begin categorically rejected Sharon's argument for the government's rejection of the report. He quoted the report's findings that there was no collusion between the Israeli political and military echelons and those of the Phalanges, or that there was never any Israeli intention of civilian deaths, as well as the IDF's repeated refusal to give the Phalanges artillery and tanks. "In light of these things, can one say that the report directly blames someone specifically?" Sharon: "I did not say it blames, I said it creates room for interpretation." Begin: "Forgive me, I am not the attorney general nor a lawyer. I did study law, this is true, but that is far from being enough. Tell me, Mr. Justice Minister, is the only argument that I make correct? Am I right in saying that the argument in this report that blames the people of Israel for the crime of genocide and the assistance of such an act, is baseless? Someone conjured an idea which is unrealistic according to the report. The report states things so clearly, one cannot be skeptical about it." In the end, the report's results were accepted and Sharon was forced to resign. Suddenly, the meeting is cut short by the Prime Minister's Military Secretary, Maj. Azriel Nevo, who reports about a Peace Now protest taking place right outside the Prime Minister's Office, calling for the government to accept the report's recommendations. "An explosive charge was set off among the protesters. Apparently there are casualties, they are checking it now," Nevo announces. Begin instructs him to go downstairs and check what happened. "It was either a charge or a grenade," he adds. "Among the Peace Now protesters, who were standing next to the Bank of Israel, there is one or two wounded, I'm still not sure." The discussion continues, Sharon and Burg are arguing, all the while Burg's son, Avraham, is among the protesters outside, and was himself wounded from the grenade. However, at this point, Burg (senior) knows nothing of this. A few minutes later, Begin cuts the conversation short, emotionally calling: "There is a causality! A Jewish causality! Azriel (Nevo), how do we assume this happened? Did one camp attack the other?" Nevo responded: "We assume so, but we have no proof. Somebody thinks a grenade was thrown. We are currently searching for shrapnel." Justice Minister Burg: "There was a protest, on one side the Peace Now people. They sang the Tikva and began dispersing. A grenade was apparently thrown. One person was killed, two seriously wounded and three officers were lightly wounded. The police chief is on his way." Begin: "Did the other side disperse as well?" Burg: "They are checking whether there were any Arabs there, but it seems there were none." See all talkbacks "Sharon in 1983: Israel could be accused of genocide"